It was a bit of a crazy week for several reasons. Some changes in my life occur and I can not predict if it will turn out for good. So I am nervous and keen and strained all the time anyways. Additionally, we Europeans have been absorbed by the Football Worldcup in Southafrica in the last weeks (You may think of it as soccer, but let's face it: You play it with your feet, whereas what is called American Football is neither played with a ball but with an egg, nor with your feet...). I am a football lover, and I support the Netherlands since I am a child. Dutch fans usually prefer loosing as long as they have seen a good game over winning an ugly game, and usually the Dutch team drops out of any tournament because they are too playful. But this time, everything was different, and the Dutch made in to the final. For the first time since I support them, which is some decades now. I haven't thought this would ever happen. However. In the end they lost the big final on Sunday. I am sad, I am dissappointed, I am gloomily. Besides the Netherlands there are also other teams I like, but they may vary from year to year. For some time now I like the German team, too, which is pretty crazy, because we Austrians grow up really hating everything German (and yes, I recognize the antagonism as we speak German....), and especially and formeost when it comes to football. But a lot of things changed in the recent years, and so I like German football, too. When I flipped through the recipe, Karen of Welcome to our Crazy Blessed Life selected, I was astonished, because when I hear "Brrrr-ownies" I think chocolate (go to her page for the recipe or have a look at Dorie Greenspans book on page 103). Indeed, there is a lot of chocolate in it - but also peppermint. But 1. we don't have these little peppermint-stuff the recipe asks for round here. And 2. I tend to like the peppermint-chocolate-combo, but my colleagues already did send me a signal that they would not be amused when I bring something like that to work. 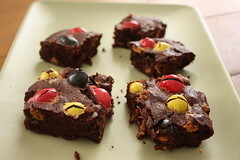 So I changed the recipe, used peanutbutter chips (which I still have from my trip to NYC, because you really can't buy something like that in Vienna), and decided to top them with "Schland"-M&Ms (Schland is a "funny" abreviation for Deutschland, the Germand word for Germany - you see, German sense of humour can be pretty, hum, unfunny...) - M&Ms in black, red, yellow, like the german flag. And we ate them during the game for place 3, which Germany won. They were great! I guess I fall in love with anything peanutbutter, so it was not too hard to convince me. But they really were the best Brownies I made so far and I would always, always come back to this recipe for chocolate brownies, no matter what other ingredients I include. I used peanut butter too, but those look great with the 'Schland' candies. My family loved them, and I hope your colleagues did too. I didn't use mint either as my mother doesn't like it. Coincidence? These look delicious!!! Love your addition of pb chips! 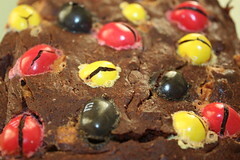 Sorry about your soccer team but your brownies look like fun. These look great with the colorful candies! And as long as they were enjoyed by those who ate them, that's all that matters. Sorry about Netherlands losing, too. I love peanut butter and chocolate--great choice. I think I would have liked your version very much! nice colors and i bet these were delish. These look absolutely delicious! One of these days I am going to get to Vienna. Thanks for baking with me this week! Sorry to hear Soccer didn't go as planned! But the brownies were a hit!!! Looks wonderfully festive! Sorry the soccer game didn't go well. But your brownies look so delicious!